I've been on a burger kick lately, but this Greek lamb burger with fried saganaki, homemade bacon, and cilantro tzatziki is my favorite I've ever made. I wanted to try to make as much of the burger from scratch as I could (as a personal challenge), but high-quality store-bought ingredients are just as good. Start by frying bacon in a medium-low frying pan to render the fat and crisp the bacon. 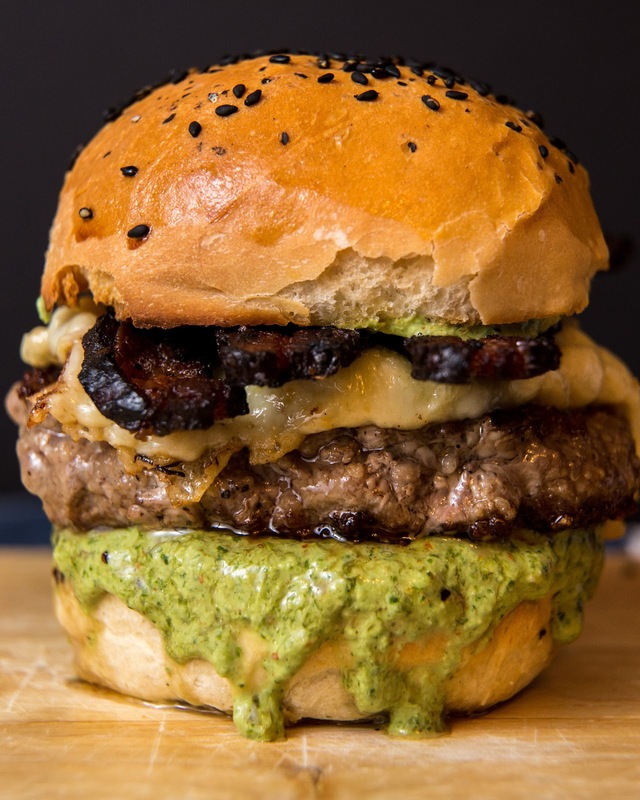 Remove bacon from pan when crispy and reserve the fat for cooking the lamb burger. Mince garlic and cilantro, and combine with the mayo. If you want a smoother presentation, you can put in the food processor or blender for a few pulses. Toast your buns in advance so you don't have to worry about these later. Form ground lamb into 3 patties and salt and pepper both sides. Get 1 non-stick frying pan going over medium heat for the saganaki, and 1 cast iron or regular pan heated up over high heat for the lamb burgers. Slice the kefalograviera (saganaki cheese) into squares and fry in a little bit of olive oil until crispy on both sides. You can squeeze a bit of lemon on top if desired. Cook the burger in your hot pan for a few minutes per side until it reaches your desired internal temperature. Assemble the burger and enjoy! Many of my latest posts have been teriyaki-obsessed. I can’t help it. It makes everything tasty! 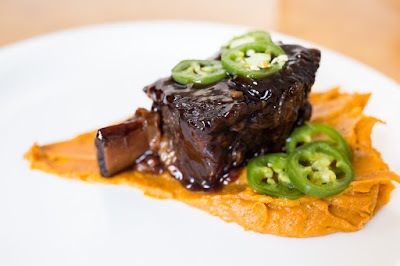 Here is an adaption to a previous recipe for Sous Vide Teriyaki Short Ribs. If you don’t have a sous vide machine (understandably), you can braise the short ribs and get similarly great results. Start by prepping the teriyaki sauce that you’ll use for the braise. Mince ginger, garlic, and the chiles. Saute them in a sauce pot over medium heat in sesame oil, until the onion is translucent. Add in the soy sauce, vinegar, and sugar, and simmer for about 10 minutes. Taste and adjust as needed. Slice onions, red/green peppers, and a few jalapenos. Layer the bottom of a roasting pan with them. Brown all sides of the short ribs in a pan in small batches. You don’t need to salt them – the teriyaki will handle that. When finished, de-glaze the pan with the teriyaki sauce. 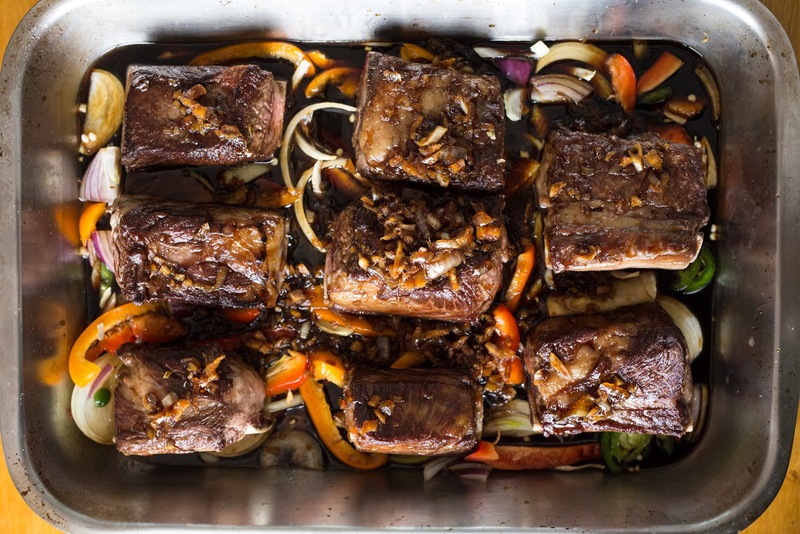 Place the short ribs on the bed of onions and peppers, and pour the teriyaki sauce over top. Cover the pan with foil or a lid, and braise at 300F until tender. It took me about 3.5 hours, but it depends on the thickness of the short ribs. Remove the short ribs and veggies from the roasting pan and spoon the fat off the top of the remaining teriyaki sauce. If you put the sauce in the fridge, the fat in the sauce will solidify and you can more easily dispose of it. 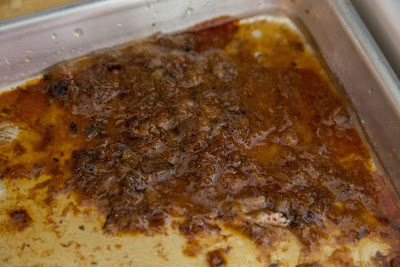 Add the teriyaki sauce to a small sauce pot and set over medium heat. Scoop out about 1/2 cup of sauce into a separate bowl and whisk in 2-3T of corn starch to thicken the sauce. This will ensure you don't end up with lumps of starch in your sauce. When the slurry is smooth, add it back into the sauce pot. Glaze the ribs with the sauce and serve! I placed the short rib on top of roasted yams pureed with ginger, and topped with pickled jalapenos. I’ve always wanted to cook a bowl of Japanese ramen from scratch, but I’ve been overwhelmed by the task. Despite the fact that I’m willing to spend the large amount of time in the kitchen to make the soup base, the sheer number of conflicting recipes and techniques made my head spin. 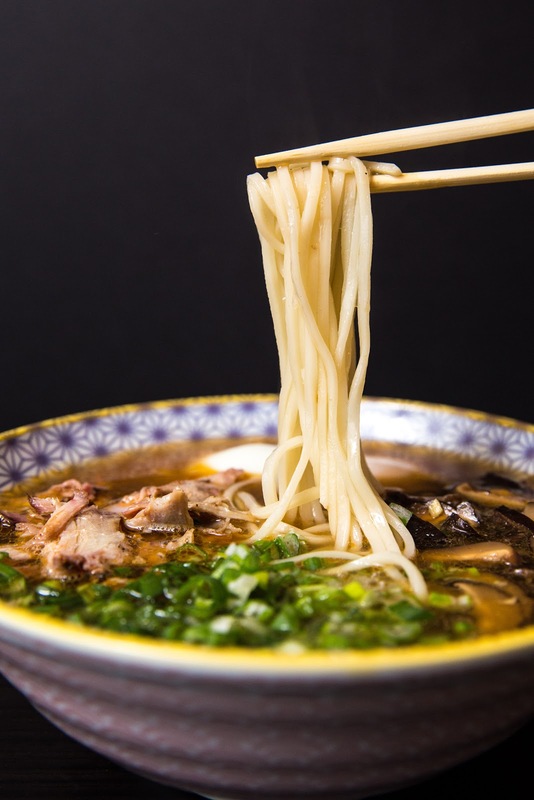 There are many different types of ramen soups (Kenji explains here), and each classification of soup has many different recipes (just like Italian grandmas and their red sauce). I made Shoyu Ramen based on a Momofuku recipe I found online. You make a base stock using kombu (Japanese seaweed), dried shiitake mushrooms, veggie aromatics, chicken bones, and pork bones. 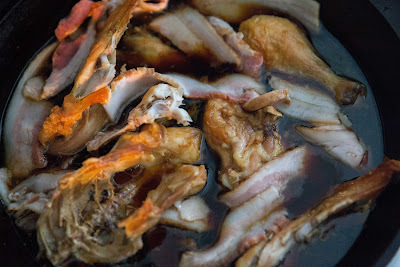 You then make a bacon and chicken-flavored soy sauce “Tare” to mix into the base stock. 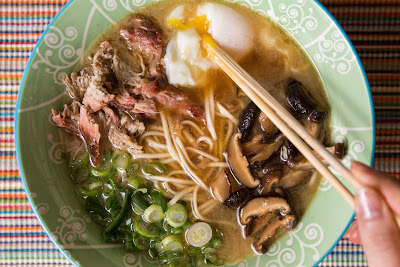 Add in noodles, an egg, scallions, roasted pork, and mushrooms and whamo! It’s ramen. Since the stock base takes so long to simmer, I ran a side-by-side experiment with a pressure cooker version and a stove top-simmered version. I wanted to see if I could speed the recipe up. Both stock bases were full-bodied and delicious, but the pressure cooker took only 3 hours, while the simmering stock pot took ~10 hours. 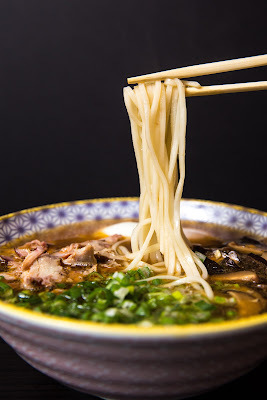 Below you can find my “fast” version of Ramen using the pressure cooker. Disclaimer: this is not meant to be the ultimate authentic recipe, but a good beginner’s bowl of ramen. This pressure cooker recipe will produce around 10 bowls of ramen. If you want to make a lot more since you’re going through all of the work to make the stock, you can double the recipe and use multiple stock pots. Simmering on the stove gets the same results, it just takes longer. Fill your pressure cooker (or multiple pots) ½ way with water. Set on the stove and bring the temperature up to 150F. 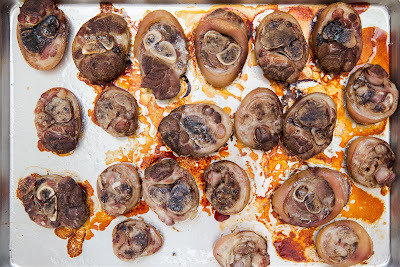 Add the 1.5 oz kombu and 2 oz dried shiitake mushrooms and remove from the heat. Let it steep like a tea for 1 hour, stirring occasionally. 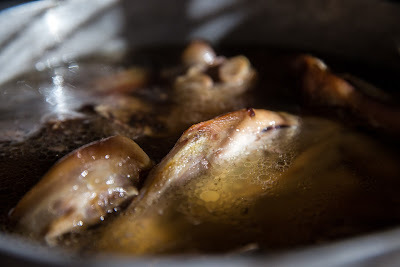 While the stock is steeping, roast the chicken bones and pork bones in the oven at 425F until browned – about 45 minutes. No need to salt or season them. Reserve the pans after roasting so you can scrape the delicious fond into the stock pot. Remove the kombu and shiitake mushrooms from the pot and reserve the shiitake. You can pickle them and use them in your ramen. Add the roasted chicken and pork to the pot. Throw in 1 medium carrot and the roots and white parts of 1 bunch of green onions. Add a bit of water to the roasting pans and scrape the brown bits into the stock pot. It’s free flavor!! Add more water until the bones are covered, but don’t over-fill the pressure cooker per the manufacturer instructions (leave 1/3 empty). Close the lid and let the pressure cooker work for 3 hours on low heat. This will produce a super-concentrated stock. Remove the bones and vegetables and strain the stock through a cheesecloth. Skim the fat off of the top - you’ll get enough fat in the soup from the bacon tare. In an oven-proof pan, roast parts of a chicken (I used 1 back, 1 thigh, and 1 leg) at 425F until browned. Deglaze the pan with the 1C sake, 1C mirin, and 2C light soy sauce, scraping up the brown bits on the bottom. Add the ½ lb of smokey bacon and simmer over very low heat for 1 hour. You don’t want to evaporate and reduce the volume of the tare, you just want to infuse it with the chicken and bacon flavor. After 1 hour, remove the chicken and bacon from the tare and strain out anything left. You can pick the chicken meat and put it in a soup if you’d like. 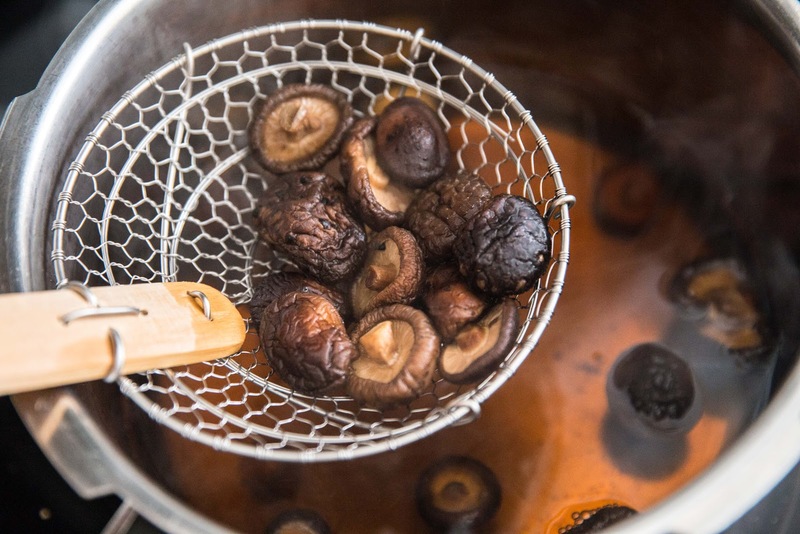 Cut off the tough stems from the rehydrated shiitake mushrooms. Slice the mushrooms and toss them in minced ginger and the different liquids. I did 1T soy sauce, 1/2T fish sauce, 1/2T vinegar, 1 tsp sesame oil, 1T minced ginger, and 1T sugar. Add 1 parts water to 1 part ramen broth and bring to a heavy simmer. In the bottom of each serving bowl, mix ~¼ cup of tare (to taste) with the hot broth. Drop cooked fresh noodles in and arrange the rest of the ingredients around the bowl. After being AWOL from our family food blog for quite some time--moving to Chicago, settling in, renovating, learning to cook all over again with an electric cooktop--I'm happily back into new food adventures. This is an appetizer we served over the holidays. 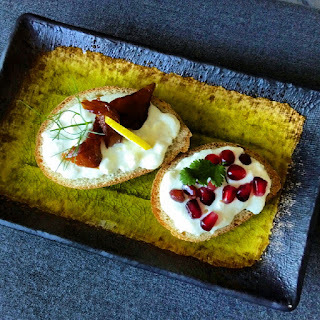 It starts with some kind of bread--crostini, brioche toasts, water crackers--gets a dollop of lemon ricotta spread and, in this case, a topping of candied salmon for seafood lovers or pomegranate seeds with herbs for a light alternative. In the spirit of trying new things, the Canadian candied smoked salmon was a home run. I'm hoping it's not just a seasonal offering from the True North Salmon Company...it was as if brown sugar and applewood smoke had done a happy dance over tender strips of Atlantic salmon. Entire packs of it can disappear while these apps are being assembled. Mix ingredients together, adjust seasonings to taste, spread on crostini and serve. I love making chicken wings. They're great for any occasion that doesn't involve white clothing (sorry P Diddy). 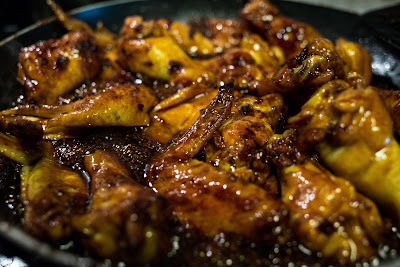 The most popular recipe on this website is Honey Garlic Sriracha Glazed Wings, so I figured I'd post another favorite wing recipe of mine. 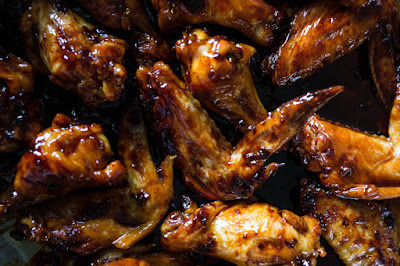 You start by making a thick, spicy, and salty-sweet teriyaki sauce, and then pour it over roasted chicken wings. Reduce the sauce to a glaze glaze under the broiler or in a pan, and they're ready to be consumed! Lightly salt and pepper chicken wings. Rub them with a small amount of canola oil and place in an oven at 375F / 180 C. Cook until almost finished (about 25 minutes based on how close the wings are together), then turn on the broiler to crisp the skin. Turn the wings over to get both sides golden brown. While the wings are roasting, de-seed the habanero, and dice it. Mince garlic and ginger as well. Saute them all in a sauce pot over medium heat in 1T of sesame oil until fragrant. Make sure to turn on your fan or the habanero will pepper-spray your house. Add the soy sauce, rice vinegar, and honey and reduce. This should take about 10 minutes. The sauce should be the consistency of warm honey when it's finished. Take off the stove and let it rest. Toss the roasted wings in the teriyaki sauce and throw them back under the broiler. You want the glaze to caramelize but not burn! If you have not reduced your teriyaki sauce and it's too watery, you can transfer the wings to a pan and the sauce will thicken up more quickly. This happened to me. A brisket is a huge hunk of meat to smoke. Therefore, you'll probably end up with some leftovers. Instead of just chucking it into your next batch of smoked beans, why not make a nice sandwich? I've enjoyed using my Anova Sous Vide machine for long, slow cooking sessions on big hunks of meat. It's so much easier to get a perfect, consistent, and repeatable outcome. I've actually been following recipes that I've found online while I'm learning to use the new tool. Everyone loves pork belly, and this porchetta recipe is perfect if you want to make something besides bacon. It's crispy, rich, salty, fatty, and balances well with something light and fresh. 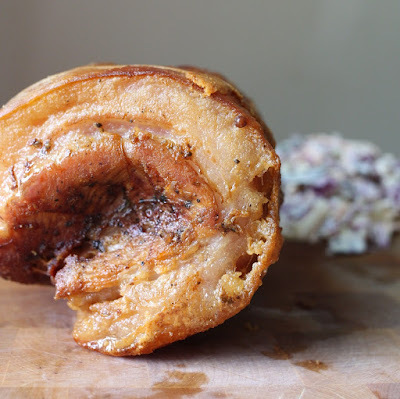 All of the credit goes to my favorite food writer, J. Kenji Lopez-Alt for creating the All Belly Sous Vide recipe. Lay the pork belly skin-side down on a cutting board and cross-hatch the inner meat portion with about 1/2 inch diagonal cuts. Rub salt, crushed black peppercorns, crushed fennel seeds, red pepper flakes, smashed garlic, and rosemary all over the inside. Roll the belly tightly and tie it with butcher string. Season the outside of the belly with a 2-to-1 ratio of salt and baking powder. Vacuum seal the belly and let it rest in the fridge for 12 hours or so. Sous vide the belly at 155F / 68.3C for 36 hours. Transfer belly to an ice bath if you're not cooking it right away. Remove the belly from the pouch and reserve the liquid that it exuded. You can reduce this down for a sauce if you want. 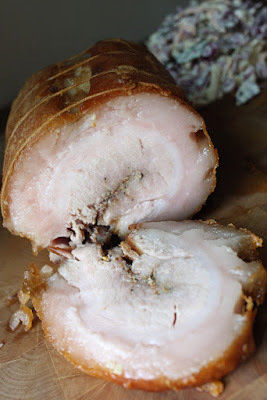 Shallow-fry the porchetta, spooning oil over it and turning when needed. 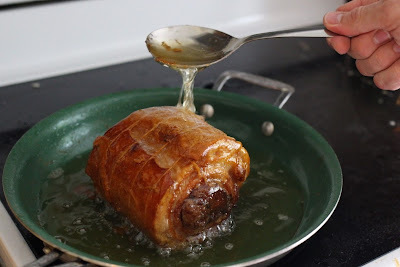 Remove from the oil when it's nicely golden brown and crispy on all sides. 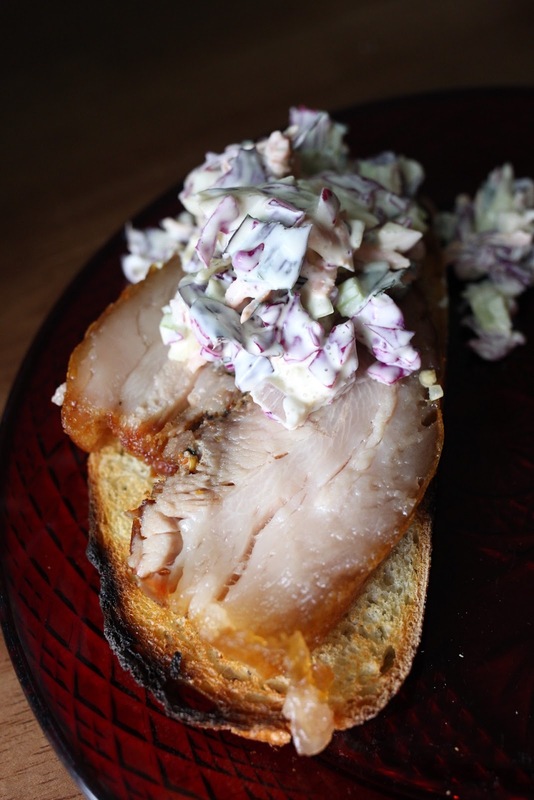 Slice, and serve over crusty toast and with some cole slaw to offset the richness.